3 Creative Camera Monopod Uses You Missed. Get The Most Out of Yours. What about some creative camera monopod uses? We already know monopods are useful for steadying your camera for both video and still capture. Should we take blurry photos and shaky videos simply because we haven't checked out a few additional simple, useful ways to take advantage of the often under-utilized monopod? A great way to grow as a video photographer or a still image photographer is to get creative with using your monopod, go beyond the typical static, eye-level perspective to create more interest and dynamics with your images. To help you get a better understanding of a topic, from time to time I share a video or two relating to the articles I write, which are meant to give you some creative ideas to make your videos or still photos, and I am treating you to a few here. Have you ever been to the zoo and been frustrated by attempting to shoot a photo of of one of its inhabitants through a fence? Here's a use for your monopod you may not have thought about. The camera monopod is your best friend when it comes to getting taller than an NBA basketball player. Attach your camera to a monopod, use the self-timer, raise your camera above the fence and you've got a clear photo, with nothing in between your subject and your successful photo. Raising your camera to a higher vantage point is often a better perspective to take for other reasons too. This is also a great tip if your stuck behind a fence at a sporting event, blocked behind the first row in a crowd at a concert, or even if you're in the middle of a celebration and you want to take a great "selfie" of you and a group of your friends together. Here is one which is fun to watch because of its unique perspective. To get a super low perspective, hold your monopod upside down with the camera at ground level. Shooting right at ground level gives this video a very unique style. The video was turned right-side up with software, and music was added to create an interesting effect. This is a video that you can create right now with your camera and any old simple cheapo monopod. The choice for music in this video makes it interesting too! If you have surround sound, crank the volume up and enjoy the overall effect of the low angle monopod shooting with the sound. What if there was another use for your camera monopod that wasn't for your camera? I first got this idea when I shot a wedding with a fellow photographer. She had me using a monopod to raise a speedlight up high above the dance floor. That's right, think outside the box. Don't use your monopod to hold your camera. Use it to hold your flash. A monopod is a great way to get your flash separated from atop your camera. You'll get more interesting lighting in your photos. 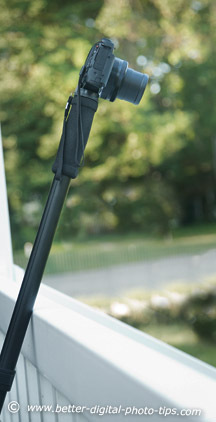 A very light monopod is plenty strong enough to hold a speedlite and a wireless trigger like this Pocket Wizard. I've used a monopod this way at weddings to get more of a 3 dimensional look to the lighting. Actually, label this practical, economical and creative camera monopod uses. This is something, I must confess that I have done very little of myself, but I think it could be of value to you. One of the general purposes of this web site is to provide you with useful digital photography tips. It's been an evolutionary process for me personally, as I am not a talented writer, I did not know what my readers would be interested in learning, and I knew nothing about web site design, html coding, or how to have any success at getting my message out their with all of the other photography site pumping out article after article after article. Well, I am here to tell you that some things do change for the positive. I've learned a few things about publishing a photography blog, enough html coding to get by, and thanks to your feedback, what you're interested in. More importantly, the purpose of the web site has grown a bit from it's initial intentions. I'd like to promote the idea that photography is pleasurable, can improve our enjoyment of life, can bring us together as people. I hope you found this article on creative camera monopod useful. Shoot more photos. Shoot better photos.